Chromosome aberrations, genomic instability, and cancer predisposition are hallmarks of a number of syndromes in which the defective genes recognize and/or repair DNA damage or are involved in some aspect of DNA processing. We report here direct interaction between BLM, mutated in Bloom's Syndrome (BS), and ATM, mutated is ataxia-telangiectasia, and we have mapped the sites of interaction. 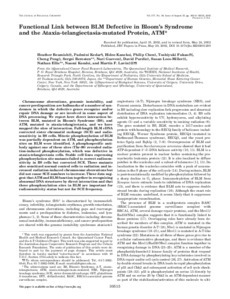 Full-length BLM cDNA corrected sister chromatid exchange (SCE) and radiosensitivity in BS cells. Mitotic phosphorylation of BLM was partially dependent on ATM, and phosphorylation sites on BLM were identified. A phosphospecific antibody against one of these sites (Thr-99) revealed radiation-induced phosphorylation, which was defective in ataxia-telangiectasia cells. Stable cell lines expressing phosphorylation site mutants failed to correct radiosensitivity in BS cells but corrected SCE. These mutants also sensitized normal control cells to radiation and increased radiation-induced chromosome aberrations but did not cause SCE numbers to increase. These data suggest that ATM and BLM function together in recognizing abnormal DNA structures by direct interaction and that these phosphorylation sites in BLM are important for radiosensitivity status but not for SCE frequency.